Background: Published in 1924 in Weird Tales after being rejected by another magazine for, perhaps, being a bit too frightening. 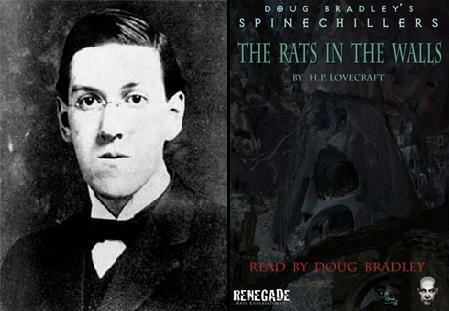 Lovecraft wrote that the idea for the story came to him “by a very commonplace incident—the cracking of wall-paper late at night, and the chain of imaginings resulting from it.” The story is not at first glance connected to the Cthulhu Mythos, but like most of his stories, it sneaks in a reference to one of those ancient gods—see if you can catch it! What it’s about: “The Rats in the Walls” is about a man of the Delapore family who moves to England to renovate his ancestral estate, Exham Priory, which the locals fear to go near. During the renovation, he begins to hear the scratching sound of rats in the walls, though no one else can hear it, and they assure him that rats cannot possibly be living in the barren stone below the house. Learning the location’s history, he discovers that there was a plague of rats that once swarmed the area from his property. He decides to investigate the bowels of the estate and finds an underground city that his family once kept: a city of nameless horrors. Either the discovery drives him mad, or he becomes possessed by his twisted ancestors—the end is left open to interpretation. Why it will keep you up at night: If you’re afraid of rats, this story just might do you in. Aside from the creepy vermin, we also confront ancient family secrets, cannibalism, underground tunnels—and all in the perfect Gothic location of a crumbling, ancient estate in a deserted wasteland. Also, rats. Lots of rats. Read The Rats in the Walls now!